Sixthman and Norwegian Cruise Lines are committed to ensuring that EVERY guest on board has access to the moments that make life ROCK! Whether you have traveled around the world and back or this is your first adventure away from your hometown, we understand that our events are unique and that you may have some questions! Our team of trained Guest Service Ninjas and Norwegian’s Guest Access Desk are resources available to you now. At time of booking, please discuss your needs with the Sixthman Guest Services team. Your information and requirements will be sent to Norwegian Cruise Line’s Access Desk approximately 60 days prior to sailing. If your needs require more advanced notice, the Sixthman team will notify Norwegian accordingly. Approximately 4-6 weeks prior to sailing you will receive your Norwegian reservation number and additional information regarding how you may contact the Access Desk directly for any additional questions you may have before embarkation. For more information about accommodations available for guests traveling with special needs, check out our FAQ. Norwegian Pearl has accessible staterooms in Interior, Ocean View, Balcony, Mini-Suite, and Penthouse categories. 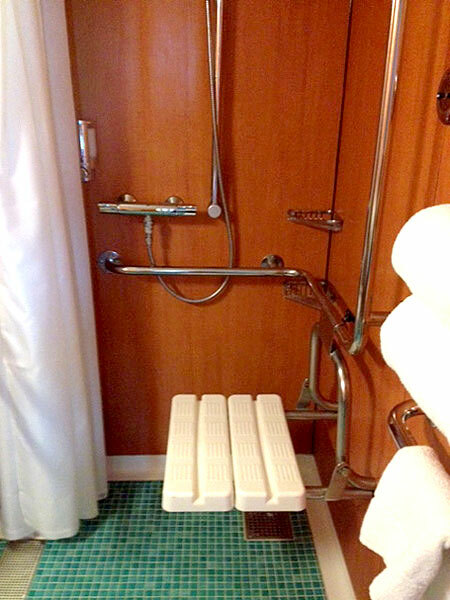 An accessible stateroom is required to accommodate motorized scooters and non-collapsible wheelchairs. Please contact us directly to reserve a wheelchair accessible stateroom as these rooms are not available to book online. Accessible staterooms include a bathroom with roll in doorway and roll in shower. The shower will either have a fold down shower seat or a separate shower seat available by request. Each accessible bathroom comes equipped with grab bars around the toilet and an adjustable angled mirror above the sink. Should you choose a stateroom that has not been designated as accessible, you will need to bring a collapsible wheelchair, or if you have a motorized wheelchair or scooter, the width must not exceed 26 inches to enter the stateroom door. All scooters and wheelchairs MUST be stored in the stateroom. Due to safety and escape way requirements, they cannot be stored in the hallways, stairways, or any other public area. As the ship has a limited number of wheelchairs available for guest use ONLY in the event of a medical emergency, if you require the use of a mobility assistive device throughout your vacation, we ask that you travel with your own, or rent one from a third party company that works with the cruise line such as Scootaround. This can be done once you receive your Norwegian reservation number 4-6 weeks prior to sailing. Stardust Theater – Enter Deck 6, port. Wheelchair accessible platform as seen above and in this map. 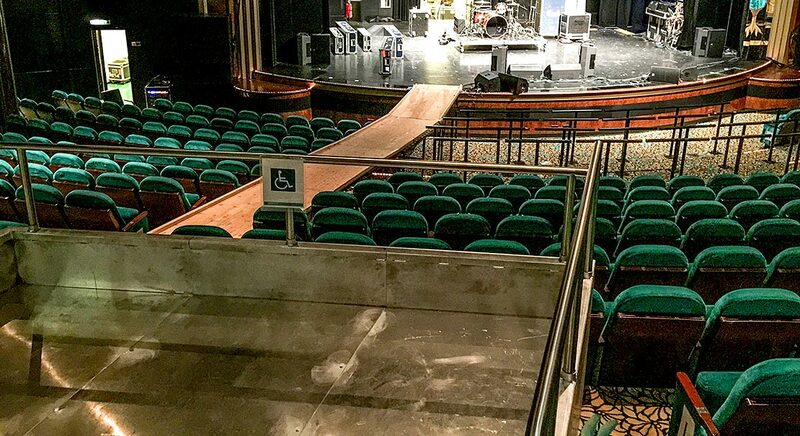 There is also additional accessible seating available for general admission shows on a first come, first served basis (located in the side areas behind Row M - enter Deck 6, port (left side) or starboard (right side). View the seating map HERE. Pool Deck – There are three designated areas on Deck 12: one directly behind the lawn in the middle of the Pool Deck, one starboard to the right of the stage and an additional accessible area port side (left) below the overhang for those looking for shade. There is one designated area on Deck 13: at the port side overlook. View the seating map HERE. Spinnaker Lounge – Enter Deck 13, port or starboard. There is a designated area to the left and right of the sound board. View the seating map HERE. Atrium – Deck 8, port. View the seating map HERE. Magnum's – Deck 6, MID. View the seating map HERE. We ask that you arrive 20 minutes prior to event start time, in an effort to assess your needs and get you comfortably seated before the show starts. During our visit to the port, the ship will be docked at a pier with a wheelchair accessible gangway. While embarking and disembarking from the ship are accessible, please keep in mind that as we will be visiting a foreign port, it cannot be guaranteed that all facilities are accessible to persons with disabilities. Some shore excursion facilities may not be fully accessible to guests with mobility challenges. Although we endeavor to make sure that companies based in the United States provide accessible shore excursions, we cannot guarantee that all are able to provide facilities that are accessible to persons with disabilities. Moreover, shore excursions in foreign ports can present challenges to disabled guests. For detailed, up-to-date information on accessible shore excursions, we strongly recommend that you contact the Access Desk (866) 584-9756) once you receive your reservation number information via email from Sixthman (4-6 weeks prior to sailing).